Last year for our October birthdays, my friend Michele and I went to Osteria Mozza to celebrate. 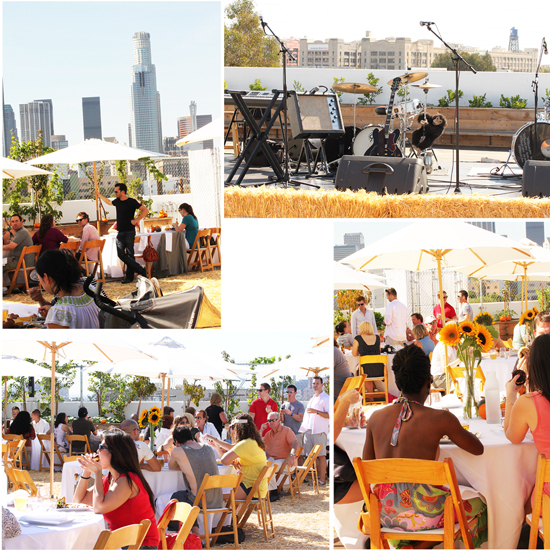 This year we went to a Pork n’ Beans Rooftop BBQ put on by the Cube Foundation, the non-profit arm of the Cube Café and Marketplace. The proceeds will benefit the Cube Foundation, an organization that is dedicated to improving dietary habits and clean-food access by nurturing minds and nourishing stomachs of underprivileged Los Angeles-area children and their families. 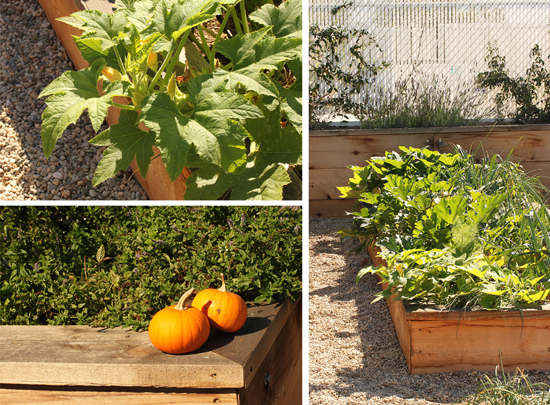 They have a team of master gardeners, food experts and educators that are working to establish a variety of programs, all based out of their downtown rooftop garden. 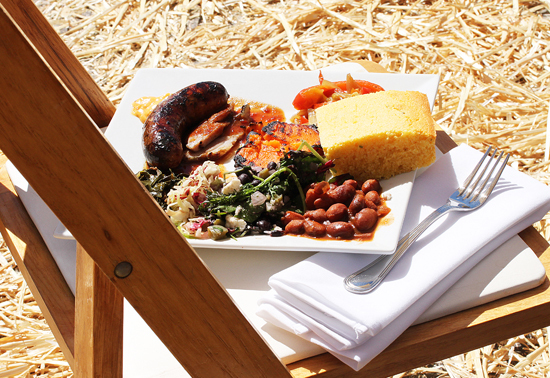 This year the Rooftop BBQ featured food from two artisanal producers, the Fatted Calf Charcuterie of San Francisco and Rancho Gordo in Napa. The dishes were prepared by Executive Chef Erin Eastland and they were set up in buffet style, so you could help yourself to as much as you wanted. The menu was hearty with Grilled Fatted Calf Sausages, Fatted Calf Garlic Brined Pork Shoulder, Nopales Salad with Rancho Gordo Midnight Black Beans and Charro Beans (Ranch Gordo Cowboy Beans Cooked with Fatted Calf Bacon & Beer). Plus Cornbread, Coleslaw, Grilled Sweet Potato Halves and Collard Greens Braised with Ham Hocks. 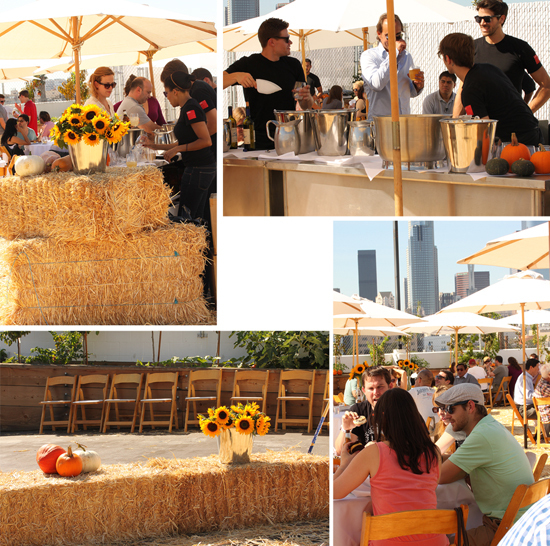 The rooftop was covered with straw and sunflowers were everywhere. It was HOT. But there were a lot of umbrellas. 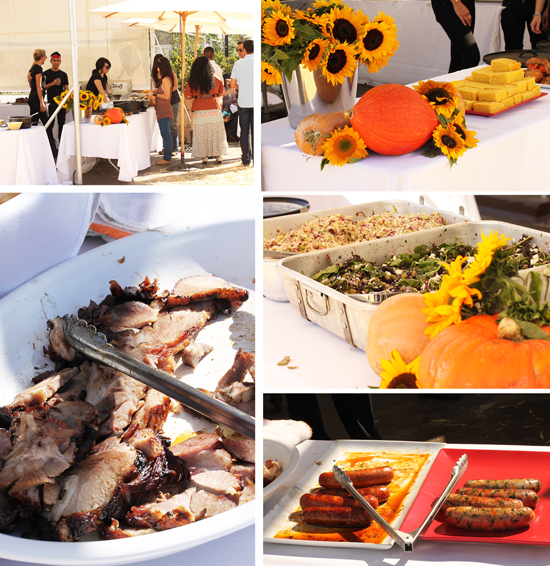 It may have been a BBQ on a roof, but we had big white china plates and cloth napkins. No paper plates for these guys. The Fatted Calf Sausages were fantastic, along with a Roasted Red Pepper Aioli. We were on a rooftop and the skyscrapers from downtown Los Angeles were all around us. 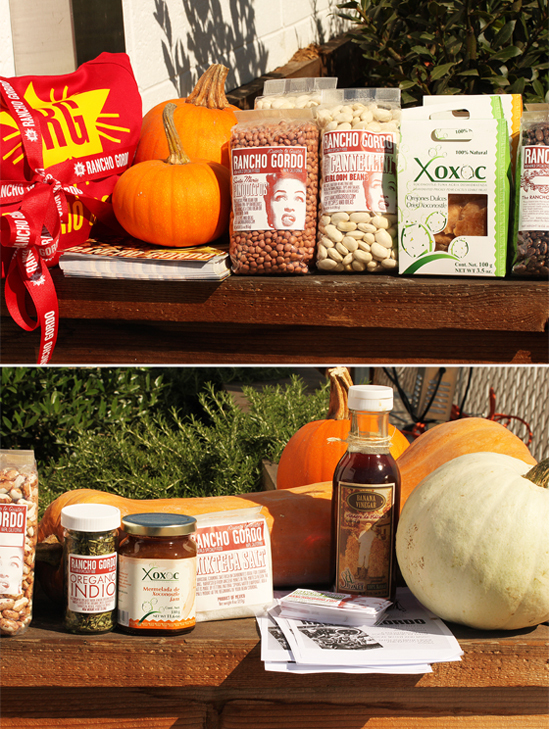 I did meet Steve Sando of Rancho Gordo and he talked about his newest products, Organic Oregano Indio, Mixteca Salt and Banana Vinegar. These are products from little producers in Mexico and he was very excited about the quality and being able to bring income to them. We took a tour of the rooftop garden while the band played. We were stuffed, and hot and it was time to leave. But we were happy we could contribute to such a worthy cause. On the way out we were given a goodie bag from the Cube Café Marketplace, which contained, among other things, this package of Rancho Gordo Yellow Eye Beans. So I made soup. 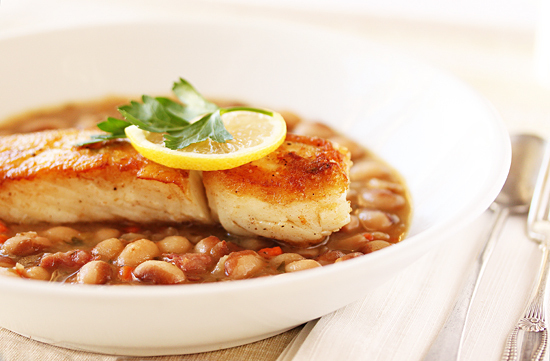 I make my bean soup quite lemon-y, so it goes very well with the crispy browned fish. If you don’t like the fish idea, I think Swiss Chard would be great in this soup. Or cut a ham steak into cubes and add it. The soup recipe is below. Please take a look at the Rancho Gordo, Fatted Calf and Cube Café websites. Very interesting. 1. Drain and rinse the beans. Reserve. 2. In a heavy bottomed Dutch oven, heat the olive oil. Add the onion, carrot, celery, and garlic. Cook over low heat until the onion is translucent, about 5 minutes. 3. Add the thyme, parsley, basil, bay leaves, broth, 1 cup water, beans and ham hock to the pot. Bring to a boil. Reduce heat to low and simmer, just barely bubbling, for 1 hour. Skim off the foam frequently. Stir occasionally. 4. After 1 hour add the second cup of water. Bring back to barely boiling. Test beans for doneness. Remove ham hock from pot and cut off meat into small pieces, returning it to the pot. Continue cooking until beans are soft, 10 to 15 minutes. Add the balsamic vinegar to pot. 5. Season with salt and pepper to taste. Add lemon juice, if using. Eat immediately, freeze in containers, or refrigerate, covered, up to 1 week. When reheating refrigerated or frozen soup, you may need to add up to 1/3 cup of broth per portion. What a wonderful event…and for such a worthy cause. Is there anything better than an outdoor/rooftop BBQ? 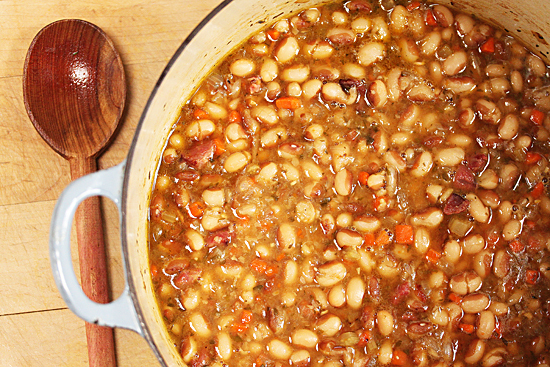 Thank you for sharing this lovely bean recipe too…I’m always on the hunt for more! Thank you for transporting me and for your kind thoughts for my family. They mean so much to us all. This is the company that made me love beans. Before, I was kinda ho-hum on beans. But Ranch Gordo’s are amazing! 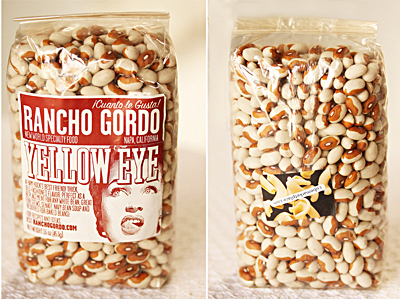 I have some serious love for Rancho Gordo products and wish they were more readily available on the east coast! What a great cause and a great meal! 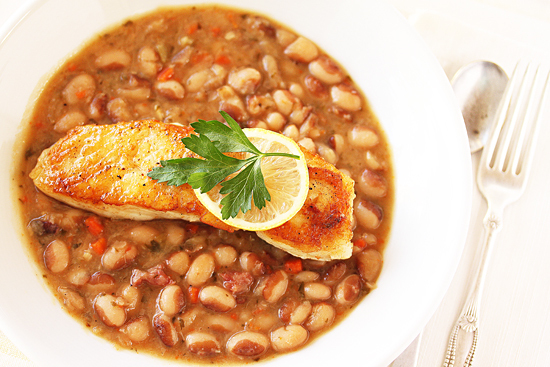 I love the sound of the fish with the beans. Both fresh and hearty without weighing you down. Just one of the most outstanding blogs I have seen in years!! You got me hot for those Rancho Gordos now. Have always wanted to try them. Great pics and a great cause to boot! Rancho Gordo beans keep popping up on my radar! I have visited their site and I really must place an order! (Hard to pick which ones!) Luv this recipe too – my husband is all for anything using a ham hock! I am making them right now and of course am confused… is it 4 cans of broth 16 oz each so 2 cups each… all together 8 cups broth and 1 cup water? OMG… It was amazing… I have found new love for ham hock, in my case ham shank. It is like I tasted my childhood and all the brothy dishes that were accompanied by smoky flavors… Now I am already adding cabbage or/and collard greens in my mind… THANK YOU !!! Just made the soup … rather than ham hock, used TJ’s Sweet Italian Sausage rolled into small meatballs – fried them to about 85% done, then into the soup, with about 25 minutes left for cooking.